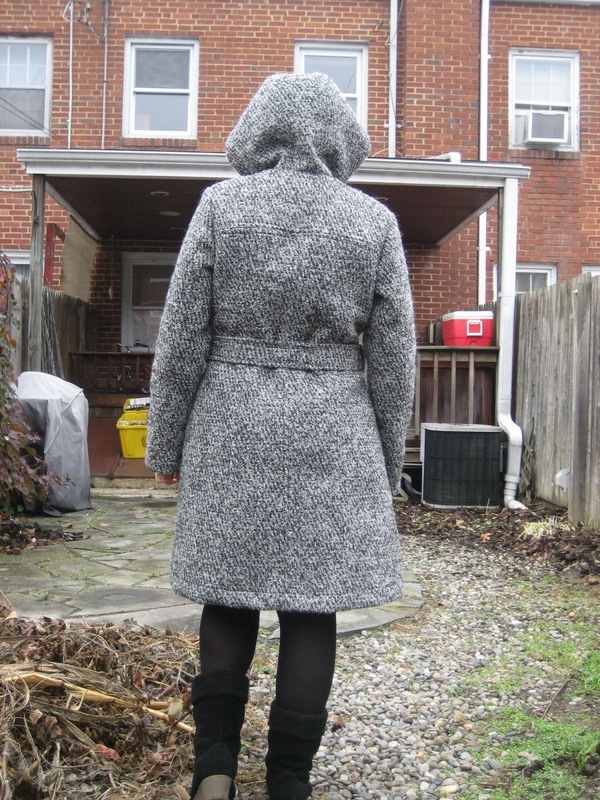 I have a long list of winter coats I want to sew and a small, juicy pile of gorgeous wools to make them. 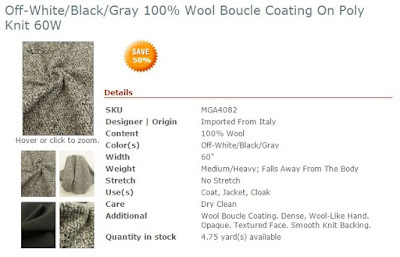 I snagged this heavyweight wool coating from Fabric Mart last month. 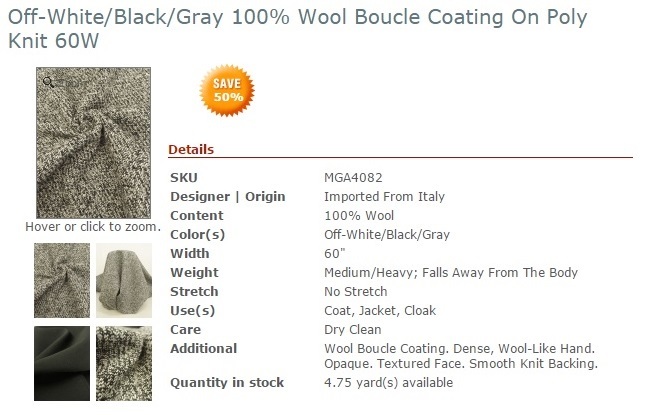 It's a bit unusual because it's backed with this heavy poly knit material... imagine a thicker, heavier version of that cup lining in a foam cup bra, then adhere a 100% wool boucle on top. This stuff is THICK and has lots of structure. I had my walking foot on my sewing machine the whole time. 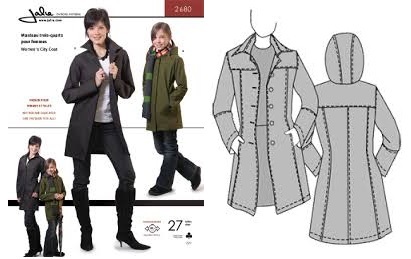 I used Jalie #2680 that even Fabric Mart now sells, it's called the "Stretch City Coat". The pattern is on the sportier side and calls for a technical stretch knit with some body to it, and it's not meant to be lined. My material has zero stretch and is very thick, so I went up one whole size to accommodate for that as well as made 5/8" seam allowances (the pattern has only 3/8" SA's). I made a muslin in a size X bust, size Y waist and size BB hip. I added one inch to the sleeve length and one inch to the bodice length above the waist. I wasn't thrilled with the length with my muslin, you can see that below, so I added SIX inches to the hem length. This is a screen shot below of the fabric I used here. I find this sort of info really helpful when I'm researching patterns and fabrics folks have used for them. The most obvious change I made was adding the belt and loops. I pulled out a random coat pattern I had on hand to use its belt and loop pattern pieces. I have no buttons or snaps here either. The coat stays together nicely with the belt alone. The coating's backing is not slippery at all, is black and attracts all lint ever--- so I underlined the whole thing with a poly lining from my stash. Black with metallic gold polka dots! From the inside view you can really see all of the piecing involved with this pattern. Princess seams are my favorite for fitting! The heavy knit backing on the coating acts as a built in interfacing, so I skipped any iron-on stuff or hair canvas. I also made the lower half of the jacket a little more of an a-line to better suit my pear-shaped figure. I confess the hem finishing isn't my best, it's more noticeable at certain angles. I had an exceptionally hard time with this fabric blind stitching by hand so I opted for the pattern's suggestion-- just top stitch with my machine. No non-sewing person will ever notice any "imperfections" in a zillion years. Raw edge of front lapel facing is serged (at LEFT). Cute and fun polka dot fabric for the pockets (at RIGHT). And speaking of top stitching, I topstitched everything on the seams! It helped smooth down the thick layers of material. It's barely even noticeable due to the busy-ness of the boucle, but I used a zig zag stitch. The pic on the left below I point to the seam on back, and squint you can see it zoomed in on... notice the zig zags?? 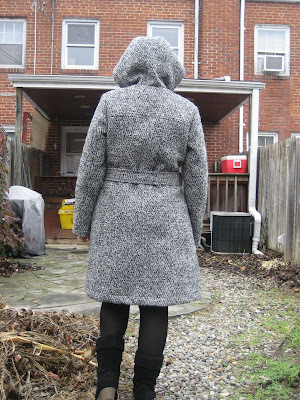 I used a zig zag to catch the raw edges of the boucle on the inside of the coat seams and to prevent unraveling. I simply serged the facing's raw edges-- I considered enclosing the edge with bias tape but it would have added more bulk to a bulky fabric. I'll be wearing this in fall and into early winter, until the real deep freeze kicks in. It's a warm coat but not having a warmer underlining I can't wear it to trounce around in knee deep snow. I feel like I am going against the grain with a fitted waist and more classic aesthetic here.... the hot look right now is boxy with menswear inspired shapes. I want one of those, too, but I feel I can't go wrong with a look like this... it'll will be worn for years to come. This is so fantastic <3 I really love that you underlined it!!! It gives a different feel to it that just works. Looks fab. The colour and hood are great. I know what you mean about the boxy thing: I am really struggling to decide on a coat pattern to sew! I love this and what an interesting coating! 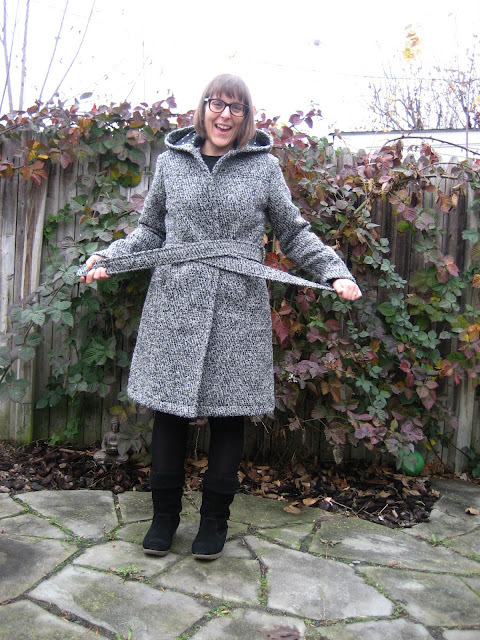 I have had a winter coat on my mind lately- yours is inspiring! Gorgeous coat! 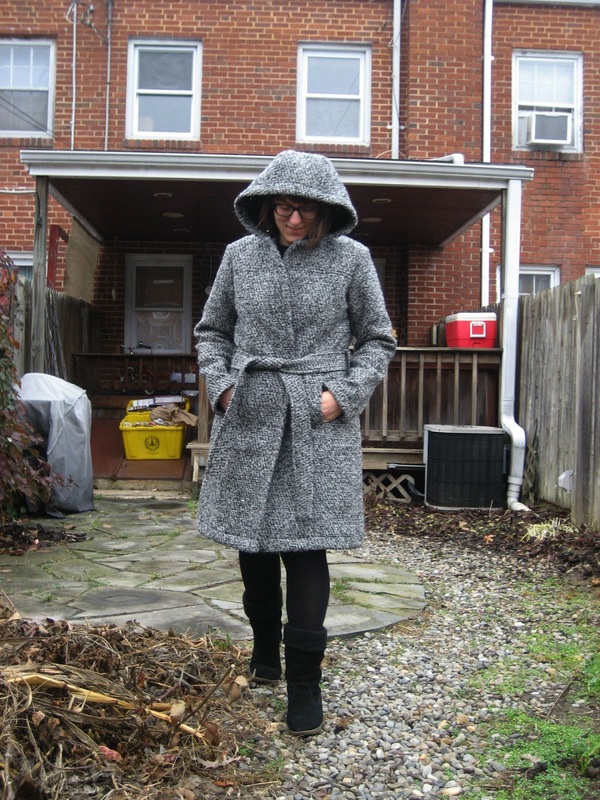 I've had this pattern for years but have never attempted it because I've been stymied by it needing a somewhat warm, but stretch fabric and not having a lining. Looks like you aced the fabric/pattern pairing! I've had my eye on this pattern for a while, Kathy! Of course you went and made something that I like more using lots of pattern modifications which I will probably be too lazy to do...sigh. Also, this fabric is amazing but I guess they must not have it anymore since there isn't a link? I'm trying to get motivated to sew a coat, but all that work is intimidating me. Plus, I'm not sure what I want to make. Gah! simply adorable! my favorite of all the things you've made. Love everything about it and it's beautifully conceived and sewn. p.s. I write on my muslins as well - kind of fun! Excellent and classic coat. Well done! What a great coat and I love all your details . Beautiful lining too. What a fabulous looking coat! It looks good on the inside too. I love your contrast polka dot fabric. 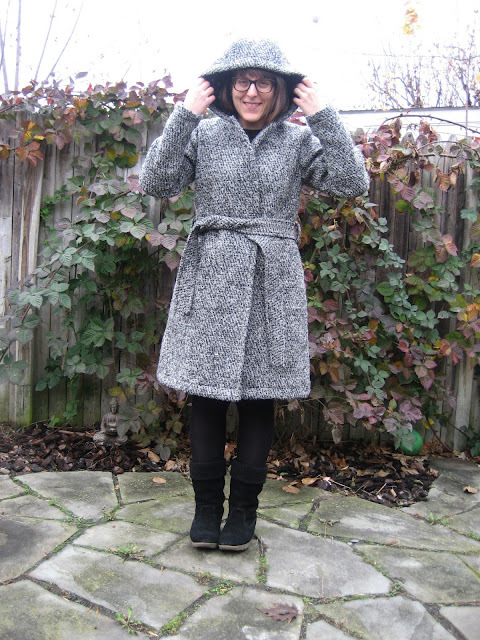 A RTW coat is no match to your look.